Growing up I wasn’t a huge fan of spinach (or artichokes for that matter), but my taste buds have become more refined as I’ve matured grown into an adult. 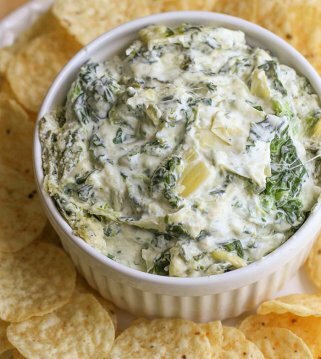 You see, I’m obsessed with Spinach and Artichoke Dip. It is one of my most favorite items to order at a restaurant. Served with warm tortilla chips, I could probably eat the whole thing with all of its cheesy goodness. 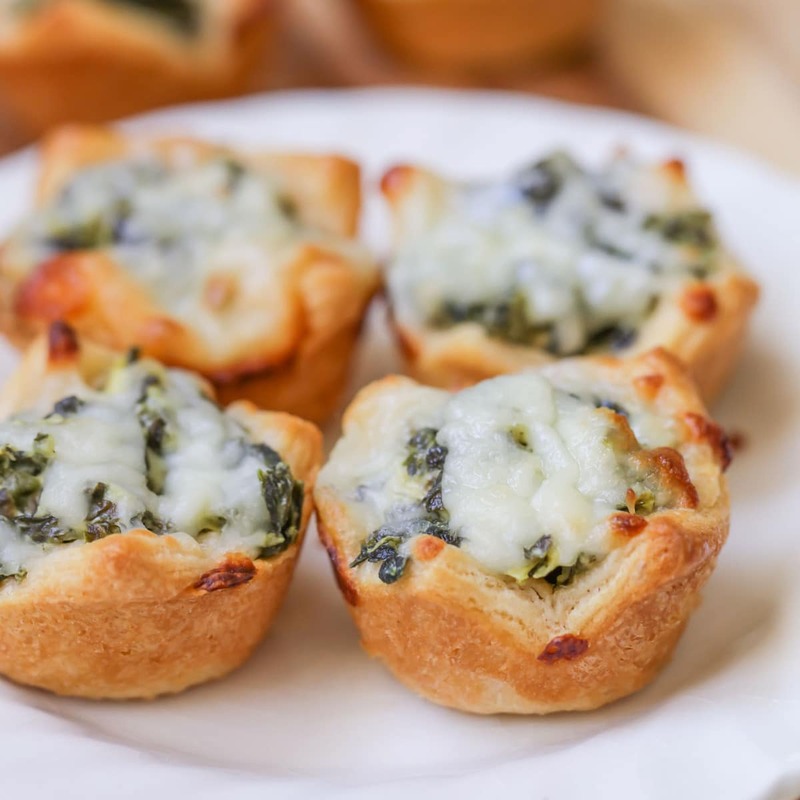 Spinach + artichoke + cheese is such a great taste combination, and you can find that combo in these bite-size and crunchy Spinach Dip Bites. 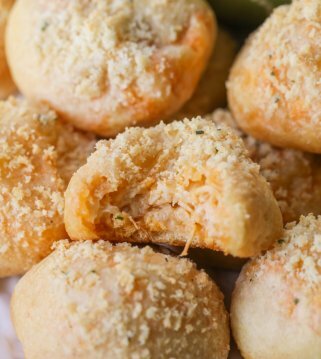 These bites are perfectly warm and cheesy, with a just little bit of crisp and crunch. 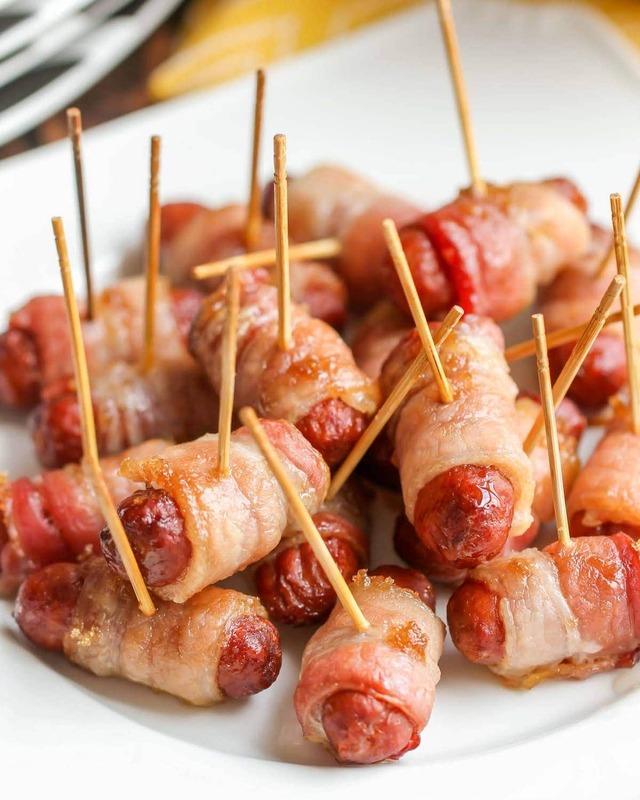 The recipe is simple too, which is why we frequently make these for parties and get togethers, along with some of our other go-to appetizers like Bacon Wrapped Smokies and Avocado Egg Rolls! They’re always a hit, but I must warn you in advance that you won’t be able to just eat one of these bad boys! 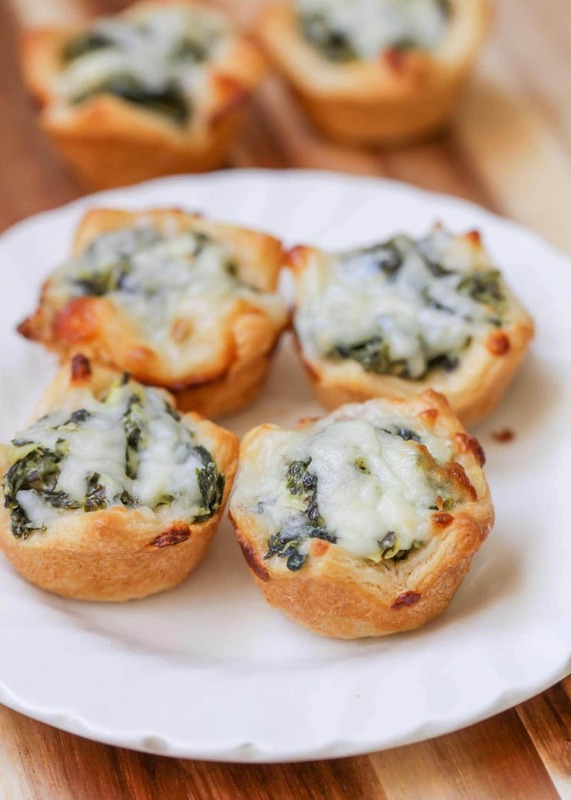 Set the dip ingredients aside and cut crescent dough into 2 inch squares and place in a greased mini muffin tin. 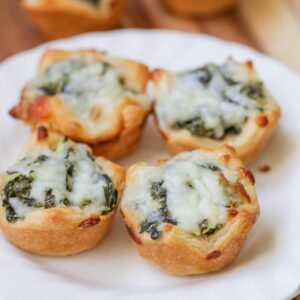 Can spinach bites be made ahead of time? Yes – indeed! Just refrigerate for up to 24 hours before baking. Be sure to cover and place in fridge. You may need to add a few extra minutes to the cook time. How to store spinach bites? Place in airtight container and reheat in microwave when ready to enjoy. To freeze, place in an freezer safe Ziploc bag and let thaw overnight in fridge before reheating. Thank you Kristyn. These look so good. Happy New Year! My mouth is sure salivating over these! 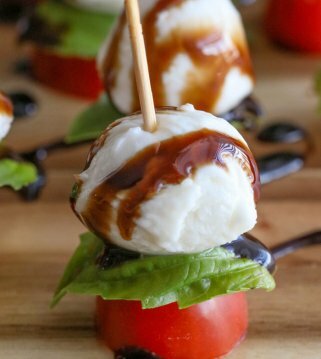 What a perfect appetizer for the Super Bowl! Definitely!! They’ll be gone in no time at a Super Bowl party. Yummy .. but can I leave out the artichoke and put more spinach? 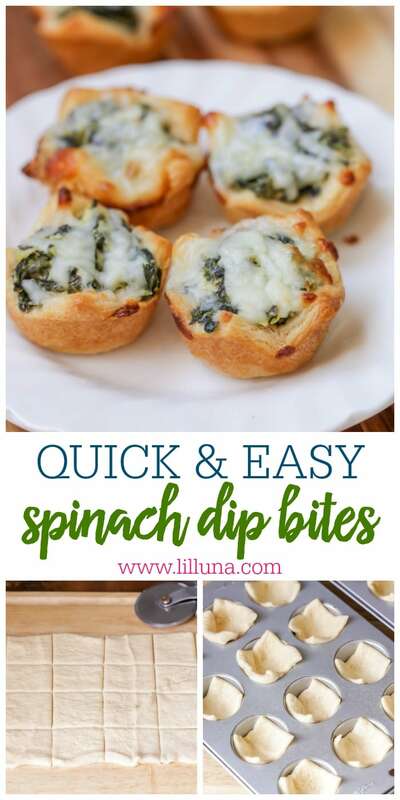 I have made these, and I think it would be great with just spinach too. As my other comment said, adding a pinch of cayenne pepper would add a bit of a bite to them, as well. I made these, but had to use Pillsbury gluten free pie crust. They still turned out delicious – even for those who tried it and are not celiac (gluten free). will these still be good if refrigerated over night? Can you provide a tip on how to cut the dough in squares? Try cutting with a pizza wheel! I’ve never purchased artichoke hearts before…is this one 6 oz jar or is at 16 oz jar? The way it’s printed I can’t tell. I want too make these for an 80th birthday party for my mom next weekend. Thanks so much! I’m going to make these for my sisters baby shower tomorrow! do you think it would work out if I made the spinach mixture today and let it sit over night? Hi. 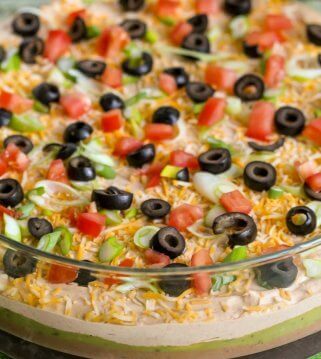 Can the spinach dip bites be made ahead and frozen or refrigerated? If so, would you bake them and then freeze them? How would you warm them if this is possible? I haven’t tried freezing them, so I’m not sure how they’d turn out. But, if you did, you’d probably have to make them first, since you don’t want to fill them with just the crescent dough. You would maybe stick them in a warm oven, since it would have already been baked and leave just until warm. If you try freezing them, let me know how they turn out:) I’d love to know and let others know! Has anyone tried making ahead and freezing?? Also, could I use fresh spinach leaves instead of frozen? Just trying to use what I have on hand. Going to make these but try using wonton wrappers. Sound so good!???? That would be yum!! Let me know what you think 🙂 Thank you!! I cant wait to try for Easter Sunday! It makes 24. I hope you all enjoy!! Thanks so much! Sure could 🙂 Hope you like them! Its nice article, Thanks for this post ,spinach dip bites looks quite healthy and tasty!!!! I’ll definitely try to make this, Thanks for sharing!!! Would I have to bake dough first by itself and then again with the mixture?? For your spinach bites is one package of frozen spinach equal to 2 cups or do I need to purchase 2 packages? Thanks. It just depends on the size of the bag. I think the bag I had did equal or was close to. In the video, a 12 count muffin tin is used. However the recipe says to use a 24 count mini muffin tin. You will need to try these, then 🙂 They are so good! Looking forward to new recipes. Made the Spinach Dip Bites today. Very good! but I have a question. Was there supposed to have minced garlic AND garlic salt? Thank you. Can you prep these the day before and stick them in the refrigerator? They should be good! I personally haven’t done that, but I don’t see why not. Though, you will probably need to fix the dough, like pull it up on the sides. They start to sink down. Hope that helps! Technically this is the best of the spinach . Hi Luna! I’ve made tHese several times and they are so delicious! Can they be reheated in tHe mIcrowaVe or Oven? I am attending a baby shower? Thanks and love your website! I would reheat them in the microwave. They’ll be a hit! Thank you so much for saying that! Thank you!! I hope you tried it or will try it, because it is pretty delicious! Thanks! I am glad you think so!! Thank you! 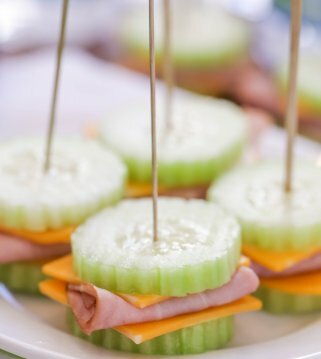 i made these for two holiday parties this weekend and they were a huge hit! Can you make these a day ahead, and then just cook the following day? You sure could. I personally haven’t, but don’t see why not. The only thing, is the dough might get hard. Can i us pre made phylo cups? Thank you Kristyn. These look so good. You are so welcome! Hope you give them a try!